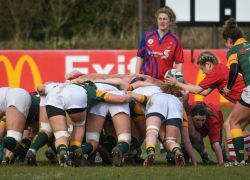 The Women’s All Ireland Cup Finals were completed this weekend to much publicity and fanfare! In the Cup Final, Railway Union took a massive step towards a possible League and Cup double with a convincing 33 – 3 win against their main rivals and defending champions UL Bohemian. Granted it was an understrength Boh’s side but that’s a big win and Railway look to be hitting form at the right time with wins against Boh’s and Belvo in their last two matches. 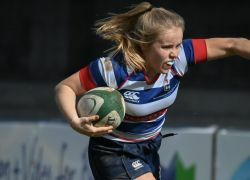 In the Plate Final, Blackrock came out on top against St Mary’s with a 29 – 19 win. Blackrock will have been pleased to pick up some silverware after a disappointing league season by their own high standards. St Mary’s, on the other hand, would have loved to have made a bigger statement ahead of their final promotion push but the Dublin outfit still remain favourites to return to the AIL League at the first attempt. In the Shield Final, Tullamore recorded a 27 – 0 win over Rathdrum which was a repeat of last season’s Shield Final. We’re pleased that our friends Tullamore will finish off what has been a difficult season with some silverware and, with a strong youth programme already in place, they should be well set to bounce back next season should the inevitable happen in the league. We did get some photos from two of the games – thanks to John for sending them in. Just click on the album below and it’ll take you to the full gallery page.